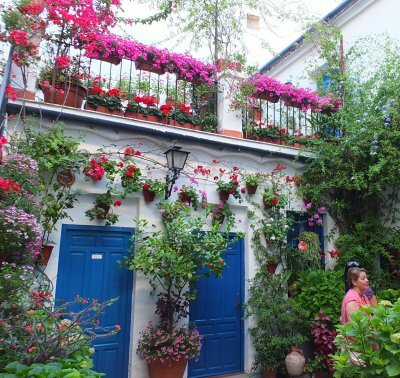 We thought we would give Spain another chance this year mainly staying inland and avoiding the main tourist hotspots of the Costa del Sol and Costa Blanca. 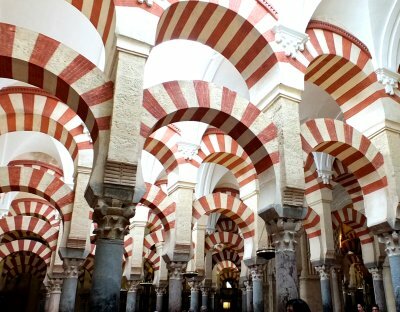 We travelled on the overnight ferry from Portsmouth to Santander and had a leisurely drive through the western provinces then zigzagged across Andalucia before turning north through Murcia and central Spain. Once across the Pyrenees we drifted northwards through rural western France to the Loire and back to England via the Dieppe to Newhaven ferry. Leaving Portsmouth early evening we luckily had a calm crossing but didn't spot any whales crossing the Bay of Biscay despite an enthusiastic talk. A short drive from the ferry port at Santander took us to the free aire at an animal park at Cabarcena but we didn't see any wild animals there. We slowly headed south west, mainly on back roads across the flat plains to reach the city of Salamanca and a campsite in the grounds of a hotel with a regular bus into the city centre. We visited the interesting city sights the next morning when it was sunny but very cold for the end of April. Continuing south we drove up to the 1728m summit of Peña de Francia for a terrific view in all directions before reaching the old village of La Alberca (a National Monument). After a night on our own in a remote village aire we stopped at the Monfrague Natural Park to look at the eagles and reached the free aire at Caceres and enjoyed a stroll around the busy city main square on a warm evening. We then crossed the Sierra de Aracena and stayed a couple of days on a campsite discovering some interesting small towns among hills covered with sweet chestnuts forests. The weather was hotter as we reached the amazing pilgrimage town of El Rocio then skirted around Seville on the busy ring road and down to the coast at the small resort of Sanlucar de Barrameda and along the Costa de la Luz where we came across the most interesting hilltop town of Vejer de la Frontera and a nearby sculpture park. Heading inland we took a winding route through the rugged Parque Natural de la Sierra de Grazalema then to another hilltop town of Olvera and to Córdoba to coincide with the annual Patio Festival fortnight as well as the amazing mequita. 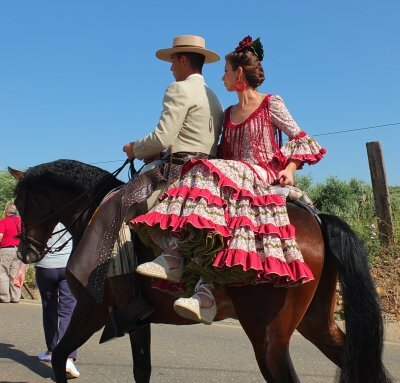 By chance we found that the nearby town of Villafranca de Córdoba was holding its annual Romería (pilgrimage procession) of San Isidro, a sight worth seeing for the colourful floats, horse riders and Flamenco costumes, capped by the cooking of 15,000 fried eggs for everyone in the evening! These few days were definitely the highpoint of this year's trip. We now headed back towards the coast via the valley of Las Alpujarras, south of the Sierra Nevada and through the "sea of plastic" along the Almeria coastline taking a diversion around the cowboy filmset country of the barren desert region towards Murcia. As it was now rather hot and the scenery not very attractive we decided to head north towards France rather rapidly, stopping at Teruel, a city with Moorish brick towers, and the ochre coloured village of Albarracín set in the mountains, before bypassing Pamplona and crossing the Pyrenees to St Jean Pied de Port in France. From there we slowly drifted north through pretty bastide towns to Cahors then on to the Loire Valley before the final stretch to Normandy and the ferry from Dieppe to Newhaven. Fuel : £762 for 4257 miles - about 28 mpg.